Tuesday • March 7 • 2017 Volume 84• Number 10 bp INSIDE: n Menards n Campbells Supply n Employment Presorted Standard US Postage Paid Permit #8 ECRWSS Vermillion, SD n Walmart Postal Patron Local Since 1934 201 W. Cherry n Vermillion, SD 57069 n Phone: 605-624-4429 n Fax: 605-624-2696 n www.broadcasteronline.com MARK’S MACHINERY, INC. March Parts Sale!! ny eet A Will M Prices * We tised -IH Adver ine Case s u nt Guaranteed Lowest Prices of 2017 en On G & Lubrica * All Prices Good Thru March 31st, 2017* Parts FREE Case-IH Cap With All Parts Orders of $250 & Up * Buy Genuine Parts at “Will Fit” Prices * STOCK UP NOW - SAVE $$ FILTER SALE OPEN HOUSES GENUINE PART 120 DAYS NO INTEREST SAME AS CASH! Yankton Thursday, March 16th Wagner Thursday, March 23rd (MINIMUM PURCHASE REQUIRED) ! PRICE DROP ! *10% off all PARTS Week Of Each Store Open House MANY ITEMS HAVE DROPPED IN PRICE - WE ARE PASSING THIS ON! 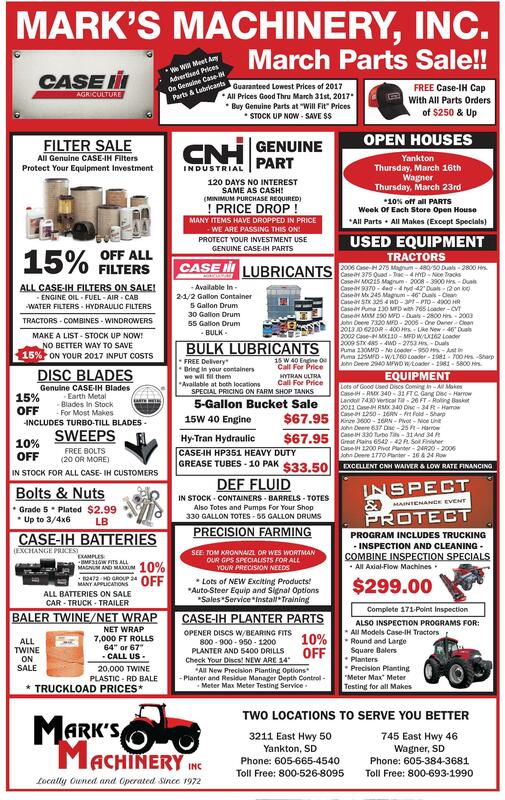 PROTECT YOUR INVESTMENT USE GENUINE CASE-IH PARTS *All Parts • All Makes (Except Specials) All Genuine CASE-IH Filters Protect Your Equipment Investment 15% OFF ALL FILTERS ALL CASE-IH FILTERS ON SALE! - ENGINE OIL - FUEL - AIR - CAB -WATER FILTERS - HYDRAULIC FILTERS TRACTORS - COMBINES - WINDROWERS MAKE A LIST - STOCK UP NOW! NO BETTER WAY TO SAVE 15% ON YOUR 2017 INPUT COSTS DISC BLADES 15% OFF Genuine CASE-IH Blades - Earth Metal - Blades In Stock - For Most Makes SWEEPS IN STOCK FOR ALL CASE- IH CUSTOMERS Bolts & Nuts CASE-IH BATTERIES (EXCHANGE PRICES) EXAMPLES: •BMF31GW FITS ALL MAGNUM AND MAXXUM • B2472 - HD GROUP 24 MANY APPLICATIONS 10% OFF BALER TWINE/NET WRAP ALL TWINE ON SALE 15 W 40 Engine Oil * FREE Delivery* Call For Price * Bring in your containers HYTRAN ULTRA we will fill them Call For Price *Available at both locations SPECIAL PRICING ON FARM SHOP TANKS 15W 40 Engine $67.95 $67.95 CASE-IH HP351 HEAVY DUTY GREASE TUBES - 10 PAK $33.50 TRACTORS 2006 Case–IH 275 Magnum – 480/50 Duals – 2800 Hrs. Case-IH 375 Quad – Trac – 4 HYD – Nice Tracks Case-IH MX215 Magnum - 2008 – 3900 Hrs. – Duals Case-IH 9370 – 4wd – 4 hyd -42” Duals – (2 on lot) Case-IH Mx 245 Magnum – 46” Duals – Clean Case-IH STX 325 4 WD – 3PT – PTO – 4900 HR Case-IH Puma 130 MFD with 765 Loader – CVT Case-IH MXM 190 MFD – Duals – 2800 Hrs. – 2003 John Deere 7320 MFD – 2005 – One Owner – Clean 2013 JD 6210-R – 400 Hrs. – Like New – 46” Duals 2002 Case–IH MX110 – MFD W/LX162 Loader 2009 STX 485 – 4WD – 2753 Hrs. – Duals Puma 130MFD – No Loader – 950 Hrs. – Just In Puma 125MFD – W/L760 Loader – 1981 – 700 Hrs. –Sharp John Deere 2940 MFWD W/Loader – 1981 – 5800 Hrs. EQUIPMENT Lots of Good Used Discs Coming In – All Makes Case-IH – RMX 340 – 31 FT C. Gang Disc – Harrow Landoll 7430 Vertical Till – 26 FT – Rolling Basket 2011 Case-IH RMX 340 Disc – 34 Ft – Harrow Case-IH 1250 – 16RN – Frt Fold – Sharp Kinze 3600 – 16RN – Pivot – Nice Unit John Deere 637 Disc – 25 Ft – Harrow Case-IH 330 Turbo Tills – 31 And 34 Ft Great Plains 6542 – 42 Ft. Soil Finisher Case-IH 1200 Pivot Planter – 24R20 – 2006 John Deere 1770 Planter – 16 & 24 Row EXCELLENT CNH WAIVER & LOW RATE FINANCING DEF FLUID IN STOCK - CONTAINERS - BARRELS - TOTES Also Totes and Pumps For Your Shop 330 GALLON TOTES - 55 GALLON DRUMS $2.99 LB ALL BATTERIES ON SALE CAR - TRUCK - TRAILER BULK LUBRICANTS Hy-Tran Hydraulic FREE BOLTS (20 OR MORE) * Grade 5 * Plated * Up to 3/4x6 - Available In 2-1/2 Gallon Container 5 Gallon Drum 30 Gallon Drum 55 Gallon Drum - BULK - 5-Gallon Bucket Sale -INCLUDES TURBO-TILL BLADES - 10% OFF LUBRICANTS USED EQUIPMENT NET WRAP 7,000 FT ROLLS 64” or 67” - CALL US 20,000 TWINE PLASTIC - RD BALE * TRUCKLOAD PRICES* PRECISION FARMING SEE: TOM KRONNAIZL OR WES WORTMAN OUR GPS SPECIALISTS FOR ALL YOUR PRECISION NEEDS * Lots of NEW Exciting Products! *Auto-Steer Equip and Signal Options *Sales*Service*Install*Training CASE-IH PLANTER PARTS OPENER DISCS W/BEARING FITS 800 - 900 - 950 - 1200 PLANTER AND 5400 DRILLS Check Your Discs! NEW ARE 14” *All New Precision Planting Options* - Planter and Residue Manager Depth Control - Meter Max Meter Testing Service - 10% OFF PROGRAM INCLUDES TRUCKING - INSPECTION AND CLEANING - COMBINE INSPECTION SPECIALS • All Axial-Flow Machines • $299.00 Complete 171-Point Inspection ALSO INSPECTION PROGRAMS FOR: * All Models Case-IH Tractors * Round and Large Square Balers * Planters * Precision Planting “Meter Max” Meter Testing for all Makes TWO LOCATIONS TO SERVE YOU BETTER 3211 East Hwy 50 Yankton, SD Phone: 605-665-4540 Toll Free: 800-526-8095 745 East Hwy 46 Wagner, SD Phone: 605-384-3681 Toll Free: 800-693-1990 OUR DATA SPEAKS VOLUMES What does this mean? It means that, as a publication audited by Circulation Verification Council (CVC), we have a clear understanding of our impact, including the number of households we reach, how much we’re read and our influence on purchasing decisions. When it comes to serving readers and advertisers, CVC is the standard. Put your trust in the Broadcaster Press, audited by CVC. Broadcaster Press ALL Carpet On SALE! Includes In-Stock and Special Orders! 109 East Third, Yankton www.hatchfurniture.com 605.665.4416 • 800.798.4663 Monday-Friday 10-6, Saturday 10-5, Evenings by Appointment FREE Local Measuring & Estimates Available! See Our Experts To Set Up An Appointment!